Many consumers do not realize that their water heater is on its last legs until suddenly there is no longer any hot water. They ignored the signs and suddenly the kids or your spouse are telling you they need to take a shower to get to school or work and there is no hot water available. Cold showers are not an option! Four Fathers Home Services can respond to your emergency call almost immediately. We can assess your old water heater and provide you with an estimate for repair costs if it can be repaired. We can also install a new water heater for you and remove the old unit for disposal. Many consumers are installing high efficiency units. Every hot water heater will be installed according to local building codes. In a few cases, upgrades to exhaust pipes may be needed to conform to upgraded building codes. We can inspect your current water heater installation in Chandler, AZ and provide guidance on the changes that are needed to bring your installation up to code. Water heaters that are nearing the end of their life cycle typically will deliver less hot water, take longer to heat the water and may even deliver brown rusty water to the tap. If you have a tub full of brown looking water it is probably time to have your water heater assessed and possibly changed. Call 4 Father Home Services today for all your plumbing needs including water heater replacement in Chandler, AZ. 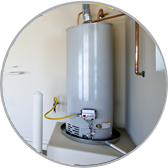 We will assess your old water heater, provide you with recommendation, remove and dispose of your current water heater and then install your new water heater if needed. Call us today to make an appointment.